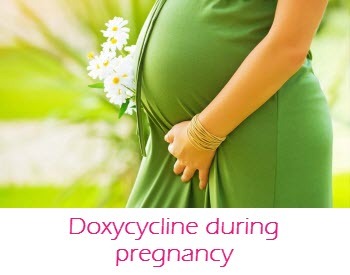 Doxycycline during pregnancy is contraindicated in pregnancy because the drug can cause liver damage in a pregnant woman; moreover, it crosses the placenta and can slow down fetal skeletal growth and cause dental defect in the fetus and fatty liver. The process of calcification of primary teeth begins with 14 weeks of pregnancy. Doxycycline can disrupt the formation of tooth enamel. Doxycycline in small amounts may penetrate into breast milk. However, the drug is not detected in the blood serum of the child's mother in the treatment of Doxycycline. Therefore, breast-feeding women can be given Doxycycline, if necessary. Opinion on the use of Doxycycline in pediatric practice is ambiguous. Until recently, the drug has been recommended for the treatment of children after 12 years. This is due to the fact that Doxycycline, like other antibiotics tetracycline inhibits longitudinal growth of bones, can cause tooth enamel and hypoplasia long yellowish or grayish brown coloration of the teeth. after cases of bioterrorism (anthrax) in the US and Canada, the use of doxycycline in the treatment of children has increased, and in some cases it is used in the preschool years. The degree of destruction of teeth depends on the duration of treatment and the number of courses, as well as the activity at the time of treating calcification process. Doxycycline compared to other drugs of tetracycline calcium binds smaller and therefore less pronounced changes teeth. The process of calcification of permanent teeth lasts from 4-5 months of age and up to 5-6 years. Therefore, the risk of adverse reactions by the teeth after a minimum of 5 years, especially if the treatment does not have a long and repeated courses. Therefore, under the age of 9 years, a contraindication for treatment of doxycycline, is defined with a margin (the likely individual variations). Antibiotics tetracycline deposited and also in the bones. But these changes are transient in nature and gradually disappear after drug withdrawal. In USA, Doxycycline is widely distributed in the form of hydrochloride. It often leads to the formation of ulcers in the digestive organs. Therefore, for children safer is Doxycycline monohydrate form JUnidoks Soljutab. This tablet can be swallowed whole, can be chewed, it can be dissolved, which is very convenient for the pediatric practice. The efficacy can be compared with the injection of Doxycycline. 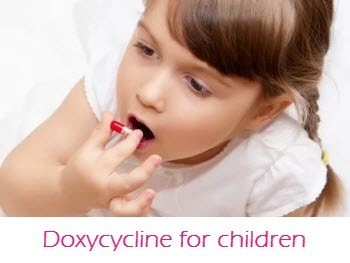 Dose Doxycycline for children are prescribed depending on the severity of the disease (up to 200 mg per day), taken orally for 2 doses with fruit juice. For adolescents the dose is the same as for adults. Doxycycline has side effects including effects on the central nervous system. This is manifested in the form of dizziness, headache. Strong has neurotoxic effects and alcohol. Together with the admission (or a short period of time) and Doxycycline and alcohol inevitably there is a strengthening of their toxic effects. Doxycycline as well as other antibiotics, not combined with alcohol intake. Simultaneous use of alcohol and Doxycycline can cause a migraine headache, retching, incoordination. 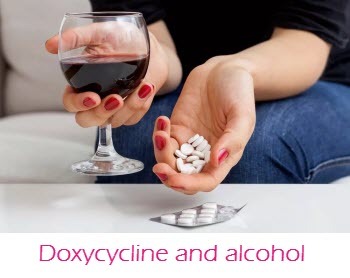 The effects of alcohol on the effectiveness of Doxycycline can be ambiguous: sometimes marked weakening of the therapeutic effect of the drug, sometimes - strengthening it. Since the drug and alcohol are decomposed in the liver, the use of alcohol during treatment increases the load on the liver and hepatitis risk of a jet. So take alcohol during treatment with Doxycycline is expressly forbidden. If Doxycycline is used for preventive purposes 1-2 times a week, then you can drink alcohol within 35 hours after taking the medicine. Smoking affects the effectiveness of doxycycline. The substances included in the cigarette smoke, influence the liver and the drug quickly decompose in the liver, which entails a reduction in efficacy. Smokers drugs begin to have an effect with a delay. Some scientists believe that the appointment smokers higher dosages of drugs. Recent studies demonstrate the effective application for the treatment of chlamydia 3 groups of antibiotics: tetracycline, fluoroquinolones and macrolides. 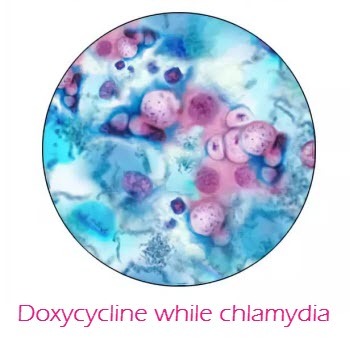 In uncomplicated forms of chlamydia (urethritis, cervicitis and chlamydia carrier without symptoms of the disease) Doxycycline is the most preferred of all the tetracyclines, because administered in lower doses (100 mg) and only in 1 or 2 divided doses per day. Even more effective in chlamydia and convenient to accept an analog Doxycycline - JUnidoks Soljutab. When combined with other chlamydia infections selection of antibiotics is carried out individually, in accordance with the sensitivity of the selection of flora. A good result in the treatment of inflammatory manifestations of the pelvic organs is noted in the combined doxycycline (100 mg daily) and metronidazole (500 mg 2 times a day). Currently, with chlamydia Doxycycline is assigned at any stage of the disease. Doses of the drug regimen, the duration of the course are selected individually depending on the characteristics of the process of manifestation. The problem of therapy of chlamydial infections is that when properly conducted treating the disease becomes chronic. Therefore, change the dose or duration of treatment should not be. Chronic process also contributes to reduced immunity. Therefore, treatment should be comprehensive and include immunomodulators (Dekaris, Timalin, Methyluracilum, Pantocrine and other drugs). Ureaplasma sensitive to doxycycline. The antibiotic penetrates the cells of the pathogen, it blocks the synthesis of protein, and ureaplasma loses its ability to reproduce and soon dies. The dose of the drug regimen, duration of treatment chosen by the doctor individually, depending on the contamination of the pathogen, the clinical manifestations and the individual characteristics of the patient's body. Usually healing occurs at 10-14 day course of treatment. An analogue of Doxycycline - JUnidoks Soljutab - is the drug of choice for treatment of ureaplasmosis. To reduce the risk of side effects Doxycycline should simultaneously take antifungal medications, and eubiotics gepatoprotektory (drugs to reduce the toxic effects on the liver, for example, Essentiale forte, Geparsil et al.). After treatment, be sure to check-up is carried out both sexual partners. Acne (pimples) - a disease of the sebaceous glands and hair follicles. Those young age and adolescents are common with this disease (80%). With abundant rash acne shows antibacterial therapy. One of the drugs prescribed for acne is doxycycline, with its broad spectrum of activity. Its efficacy in the treatment of acne is due to the fact that it is highly soluble in fats and is able to penetrate into the ducts of the sebaceous gland and hair follicle. 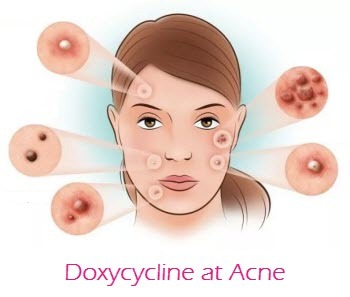 Therefore, Doxycycline has the advantage in choosing an antibiotic for the treatment of acne. It has the meaning and the low price of the drug. Severe forms of acne should be treated dermatologist. He will choose the dose of the drug and conduct monitoring during treatment, appoint external treatment if necessary. Most used intermittent courses of antibiotics for a long time. The use of doxycycline for acne gives a stable and long-lasting remission of the disease. Causative agent of tick-borne relapsing fever (Borrelia) is transmitted by the bite of ticks. Therefore extracted from the body of the tick is recommended to take to the lab for research - whether it is a carrier of Borrelia. 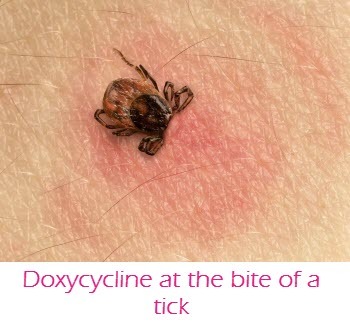 Given that the incidence of Lyme disease is high, with a positive response from the laboratory (ie Borrelia infected ticks) is assigned a prophylactic course of doxycycline for 3-5 days at 200 mg per day for 2 admission. Children over 8 years - 4 mg per 1 kg of body weight. Children up to 8 years prescribed prophylactic course of Augmentin or azithromycin. Preventive course to be held not later than three days (72 hours) after a tick bite. With timely and correct implementation of the courses Doxycycline is effective for the prevention of borreliosis. Pregnant women and nursing mothers antibiotic course is not carried out. According to the reviews available on the Internet, was the result of effective treatment with Doxycycline: When chlamydiosis - 70% (from 12 reviews) syphilis - 2 positive results; in the treatment of acne - 2 positive reviews; in the treatment of inflammation of the sinuses - 3 positive reviews; in the treatment of borreliosis (Lyme disease) positive in 4 cases out of 6; 1 positive opinion for the treatment of yersiniosis. We do not get a good result in the treatment of gonorrhea (1 review), mycoplasma (1 review), urethritis (1 review). In 5 Reviews marked adverse reactions in the form of manifestation on the part of the digestive system. Before use, you need to consult with a specialist. Note! This site is not an online pharmacy. We do not sell the medicines or other products. It is only information resource.